Discussions have been going on concerning amending and updating the constitution we “inherited” from the former Leatherhead Society in order to make it more appropriate for our new Leatherhead Residents’ Association. A set of amendments for the complete overhaul of the constitution is now ready. This was published on our website this morning. If you have not seen this, return to the home page and click on the menu bar. As well as reading the set of proposed amendments online, you can also download them in PDF format. There are, in fact, two PDF versions: one simply states each amendment and gives the amended clause in full (i.e. just like the web page); the other gives all this as well as the rationale for each proposed amendment. Progress has been good. The entire length of the path and the sub-base has been laid and some attention is not being given to the installation of the barrier at the Thorncroft Bridge end and the seating. The top surface of the path will be laid at the beginning of next week, we hope. The weather forecast for this week is not encouraging and we are reliant of dry conditions. The contractor has done a nice, neat job with little disturbance to the vegetation on either side of the new path. A resident recently asked what happened to MVDC’s plan to implement a Controlled Parking Zone (CPZ) in Leatherhead. 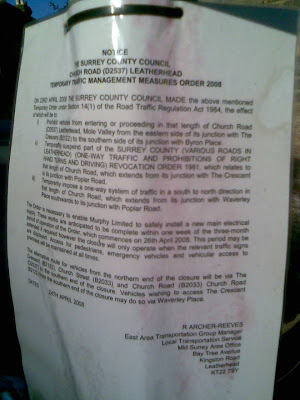 Mole Valley’s Parking Strategy was outlined in 2006. SCC looked at the proposal in March 2007. 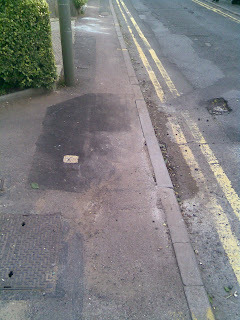 Last year the the Leatherhead Advertiser reported that the scheme in Dorking had had some difficulties. (link required). The CPZ in Dorking is giving some problems which you will have read about in the press. Only when these have been resolved will the Leatherhead area be considered. Nothing will be considered for Leatherhead until Dorking’s is up and running. Does the Residents Association have any views on the Subject ? We recently added the News Feed for Surrey Police on the Blog (see right hand column). You may have seen the signs up on the approach roads to the Town Centre…. Here is a tale that demonstrates problems that individuals may encounter when dealing with SCC Highways. This was sent in by a Leathehead resident, but the problem with SCC is not uncommon. Early April a a White notice was posted on lamp posts in Church Road & Waverley Place, Leatherhead. The rather complex notice indicated that the stretch of road from The Cresent to Byron Place would be closed to traffic for the weekend of 26th April. The direction of traffic on the remainder of Church Road would be reversed. Church Road is a one-way street. A number of residents thought that the notice was unintelligible. A fax was sent on 16th April to SCC to ask for clarification & perhaps a simple diagram. There was no response from SCC. 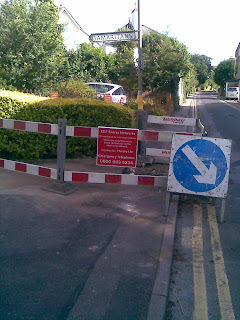 On the 25th April 2008, “Advanced” notification signs were place at the junction of Church Rd & the Crescent warning of the pending roadworks. The following day contractors, turned up dug a trench across the 4m stretch of road & a big hole in the pavement by the Samaritans (7 Church Road). The trench was cover and a rough tarmac surface added by the end of the day. 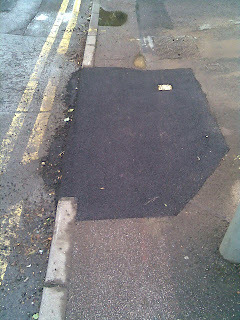 The hole in the pavement was filled & a rough surface of tarmac added; the paving stones were taken away. The following day, Sunday, the contractors turned up and removed the traffic restrictions. No further work was done. A Web Form was completed on the SCC website the next day stating that the work had not been completed in a satisfactory manor. The following day a representative from SCC AW) called to say that they would look into it. Nothing happened. On 30th April 2008, an email was sent to the local MV Councillors asking for help. The Councillor managed to contact the Area Manager for Highways at SCC and requested information. On 20th May 2008 no response had been received from SCC and so a further email was sent to the Councillor. On 27th May 2008, SCC replied to the Councillor stating that as far as they were concerned the work was completed but they would investigate. The Councillor then advised that the SCC Officer was emailed directly if there was no further news. On 9th June 2008 the SCC Officer was emailed quoting the original reference given by the Web Form automated response back in April. No satisfactory response was received. Another email was sent on 16th June asking SCC for answers to the Church Road hole & also for answers to questions asked via the SCC website over a year earlier. 18th June 2008 – a response from SCC arrived partially answering the questions from one year ago. 19th June another email was sent to SCC asking for the information about Church Road. A response was received the same day stating that Church Road would be resurfaced later this year. (Are they mixing this up with Church Street?). An offer of a meeting was made. This was declined because at this point it was becoming obvious that SCC really had no answers. The officer than suggested that the SCC help line was called so that so that the resident’s concerns could be addressed !!!! 20th June 2008 – SCC helpline called with a list of outstanding questions. Another reference number was given. This was emailed to the SCC officer. Again this fell on deaf ears. An email was then sent to the SCC officer stating that a Freedom of Information Request would be raised against them. 24th June 2008. Two SCC Officers called. The first (ED) saying that they almost had all the information to answer the questions from one year ago, but they could not reply because they had not got the email address. Could the resident call the SCC number and leave a message for the Officer with the email address. Bizarre – how many emails had they already received with the residents address on it? The second officer (AW) stating that the Church Road roadworks were due to finish the following day & they would look into things. Guess what ? At the time of writing neither AW or ED had replied…. and there was still a hole in the pavement !! Now one useful piece of information did come from all this . In the phone call on the 20th June 2008 with SCC, the lady answering the phone at SCC did say that the contractor doing the work ( a large energy company from over the Channel) was a law unto itself. SCC have no control over them and they do whatever they please when they please. SCC web site inquiry service is pointless. Don’t fax them; you do not get a reference number. The local Councillors, try as they might, may also suffer the same poor communications from SCC. The Leatherhead Residents Association should use expertise in the Committee to strike up a solid communication channel with SCC Highways so that residents concerns can be answered. This poor communication is not just an SCC problem – try emailing contact addresses at MVDC. The planning depart is good at responding. Recycling Officer will reply after a couple of weeks & a couple of email reminders. Ironically, if you email the communications officer at the email address given on the MV Viewpoint you get no response !!! Hole filled in but no paving stone – back to the original state of affairs. Following a further web enquiry & a direct mail to SCC MV Highways Manager, an email was received from SCC stating that they had had a lot of problems contacting EDF and their contractors. An SCC officer went to the site yesterday (07-07-2008) and managed to speak to the contractors. I mentioned to them that the kerbstones needed to be replaced and they agreed but did not have any indication of that on their job sheet. They have told their manager to order new kerbstones and install them this week. Turn left down Thorncroft Drive to the Leisure Centre and then entering Leatherhead Town Centre via the Town Bridge . Turn left down Thorncroft Drive and use the new River Path. Continue up Dorking Road (Gimcrack Hill). Each of these routes has problems and dangers. Thorncroft Drive does not have a very good surface for road going bikes. Cyclist are then faced with the dangers of exiting Fetcham Grove and getting over the Town Bridge. Cycling along the new River Path is frowned upon by some members of the public because the perceive bikes to be dangerous. Gimcrack Hill is not safe for bikes because of parked cars, motorist ignoring the transition to 30 mph zone etc. The Government is trying to encourage cycling to get folks out of their cars and so SCC should make cycling as safe as possible. Better protect need to be afforded to cyclist choosing to the Gimcrack Hill route. Improve signs for motorist informing them that cyclist may be on the road. More indications to drivers e.g 30 mph painted on the road, to warn of the reduced speed limit. A ‘soft’ cycle lane painted on the road from the exit of Thorncroft Drive up to the area where cars normally park on Dorking Road. Please can the LRA put this on it’s list of things to discuss at one of LRA meetings (August).